Retargeting Ads: What Is It & How Does It Work? Getting traffic to your website is hard, and expensive. They’re all just starting to get to know your brand online. But, most of them will come to your website and then leave without converting, and it’s highly likely that you will never see them again. I mean, we spend all this time getting users to our site, only to let 75%+ leave forever. …So, if you aren’t running website retargeting ads, what you have now is a warmed up user, who clearly has interest in your business, but is completely anonymous. You don’t really know who they are, so you can’t go out in the world and find them again. In fact, they’re probably more interested your company than they’ll ever be because your brand is fresh in their mind! It would be a shame to miss out on the opportunity to get back in front of them again before they forget who you are, which is why I want to talk to you about a simple little advertising tactic called website retargeting. Website retargeting is the ability to serve ads to people that have already visited your website. (So, to our lowest hanging fruit customers, AKA warm traffic). And you can do website retargeting with Facebook, Google, Bing, Yahoo, Quora, Twitter, LinkedIn, and a few other places. But, it doesn’t really matter where you’re doing website retargeting. What’s important is the act of getting the information of those anonymous users, connecting it to a platform and then serving an ad back to them. This proven system is one of the fastest ways to increase inbound leads or sales for any E-commerce store, any website that has a working inbound funnel. 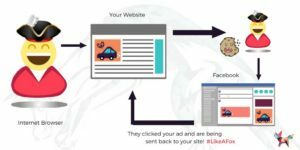 How Does Website Retargeting Work? So, you might be wondering how it works. Large social networks – Facebook, Twitter, LinkedIn, Google – and other sites that allow you to advertise will provide you with a piece of code called a pixel. Once the code is installed on the pages of your website, anybody that visits your site will be “tagged” with this piece of code. Now, when the same users who have been tagged with your cookie go back to Facebook (or LinkedIn, Google, Bing, etc), the pixel will help the platform identify that user. So, the platform has now identified that “John Smith” has been to your website. You don’t actually know his name at this point, but the advertiser knows who to serve the ad to. And now, you can create an ad campaign in the back end of the platform and tell it to run ads to John Smith and anybody else that visited the website… and boom! You’re serving ads to people that have visited your site, but haven’t converted yet.You’re serving ads to people that have visited your site, but haven’t converted yet.Why Are Retargeting Ads So Valuable? Why Are Retargeting Ads So Valuable? This is because your audience is going to be smaller – only people that visit your site, not the entire world – and “warmer” – only people that have heard of you via visiting your site. To give you an idea of the power of getting someone back to your site (and therefore the power of retargeting), let me pull some stats for you from our own agency website. 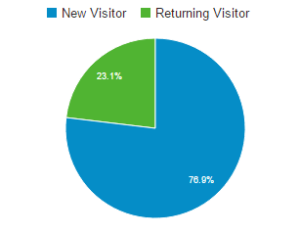 We don’t get tons of traffic by any means… just about 4,000 monthly unique visitors. Now, there are ways to optimize and improve this metric on its own, which are important, but let’s pretend we’ve done our best, and .5% is going to be our baseline opt-in rate for new visitors. Sounds like we’re screwed, right? But, what about returning visitors? If you dig into the details a little further, you will find that anyone that had visited the site 2 or more times, opted in at a rate of 9.6%, or 1912% more often. Starting to get the importance of getting people back to your site? 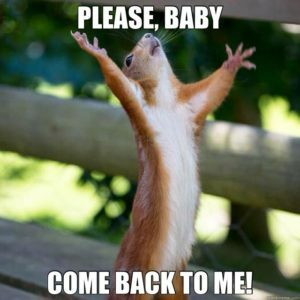 Why are Returning Visitors More Likely to Convert? They’ve enjoyed your content for an extended period of time. They chose to come back, which implies they like you and have even stronger intent than the first time. So by getting people back to your website, you’re able to build enough trust to break the “trust barrier,” at which point users become fans and are more likely to give you their email. They were doing research (and are now ready to make a decision). People don’t like giving strangers their email address. Plain and simple. There is a psychologically minimal amount of time we prefer to wait before dropping it in there. You know because you’ve felt it. Think of a networking event, don’t you hate when someone tries to give you their card before you’ve said 10 words to each other? Yet, the person who you’ve made a deep connection with and is sounding like a promising business connection… You’re thrilled to get a card from them. Such is true in real life, and online. You have to provide them with comfort, tremendous value, and a strong reason to continue the conversation. Have some customers you are emailing, but aren’t seeing the kind of sales you’d like from those campaigns? Add an additional touch point by sending targeted ads to everyone on your email list. This will reinforce your offer and give the user an additional touch point to consider purchasing from you. And more importantly, you can get in front of those 60%+ users that didn’t even open your email! You can either upload a file or copy and paste the list in from a document. Once the list is uploaded, Facebook will begin matching your list with their own. Don’t worry, the information is secure and Facebook is not stealing your user data (or so they say). They are simply looking for anyone that uses Facebook with any of the emails that you’ve provided. Tip: Use the date for the name of this custom audience. Email lists change all the time, and it’s helpful to know when you last uploaded your audience. This process will take a little while, so give it a rest and come back later to pick up. Create a simple, yet compelling ad, and set your budget appropriately (which could be as low as $1/day depending on your list size). You’re hitting your #1 fans… The people who were brave enough to trust you with their email addresses… With an ad sending them straight to your store, product, or pricing page. I can’t think of a better way to put your hard earned list to work for you. 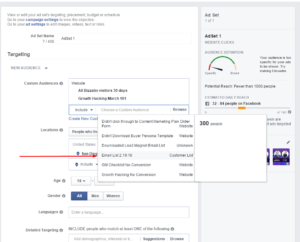 Now there are additional segmentation strategies you can do with your Facebook custom audience, but if you have a simple list, or a small list, it’s best to just start with ANY retargeting campaign, and then optimize from there. This technology is allowing us to enlarge our retargeting audiences and run highly targeted ads to “warm” traffic. 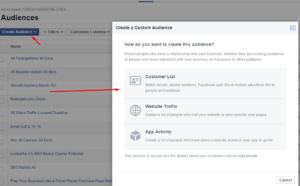 While there are many different types of retargeting ads that you can run to boost your business, the most important thing you can do is set up your Facebook custom audience pixel and/or Google’s remarketing pixel, and just start building your audience. Not doing this is leaving mad amounts of money on the table and preventing you from hitting your maximum potential conversion rate for your on-site traffic. Getting people back to your website for a second time is more important than getting people to your site the first time. Set up this simple retargeting process and plug a huge leak in your online marketing strategy.